In my 36 years of life I now have two complete home renovations (and 352 gray hairs because of it) under my belt. Yes, they are exhausting and emotional and every time I finish one I promise myself it’s the last time. But even I don’t believe myself. 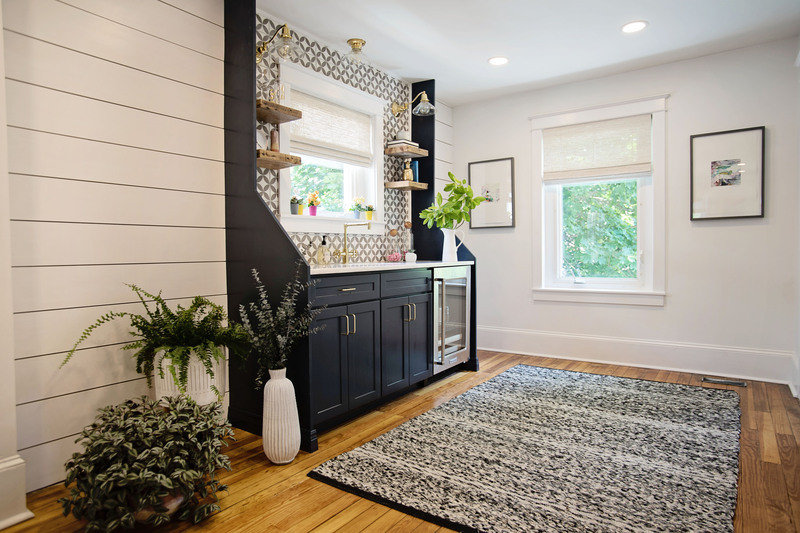 Similar to styling outfits, I love home decor and the excitement of watching a space evolve that a renovation project provides. 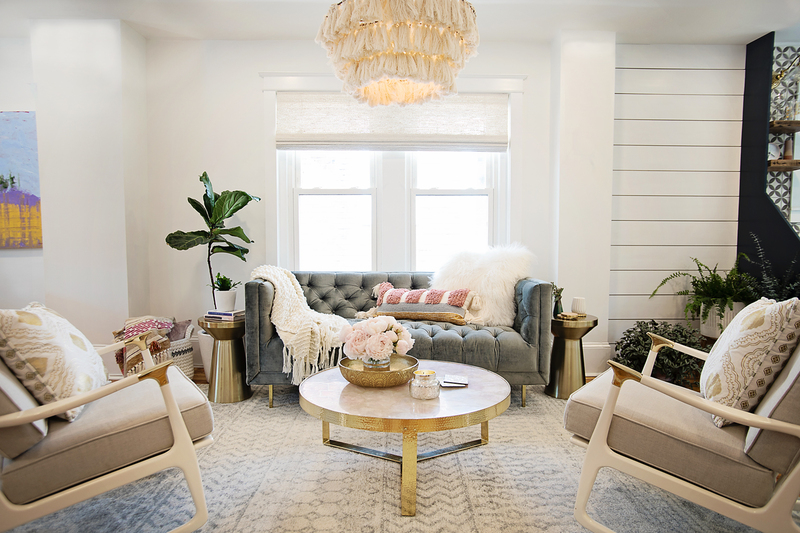 Based on the feedback you all gave me with our TMC HQ reveal, I thought you would love an in depth interview with Larina Kase, the amazingly talented interior designer who help me transform my space (follow her here for some amazing home decor inspiration). And because the Nordstrom Anniversary Sale is in full swing, I couldn’t help but to ask her what she is eyeing up, plus some of my own picks! See below! Q: How did you get your inspiration for this project? A: Lindsey 100%! As you know she has amazing style (obviously!) and it was no surprise that she had a fabulous vision for this space. She wanted it to be “industrial chic,” with a unique creative vibe. I always see my job as executing my client’s style. 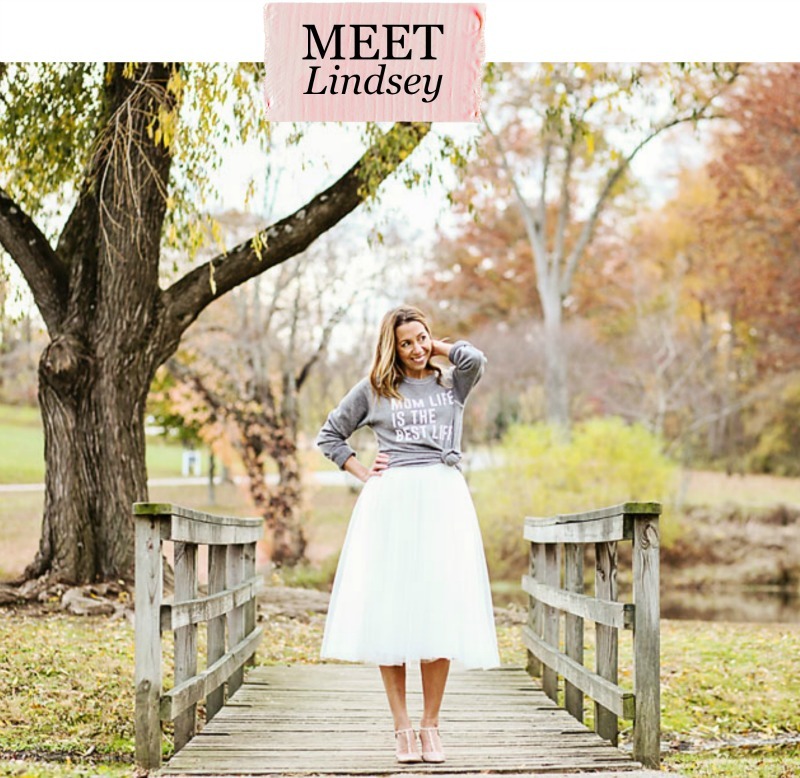 Often clients aren’t exactly sure what that is and I help them figure that out, but with Lindsey it was clear so we were able to hit the ground running! 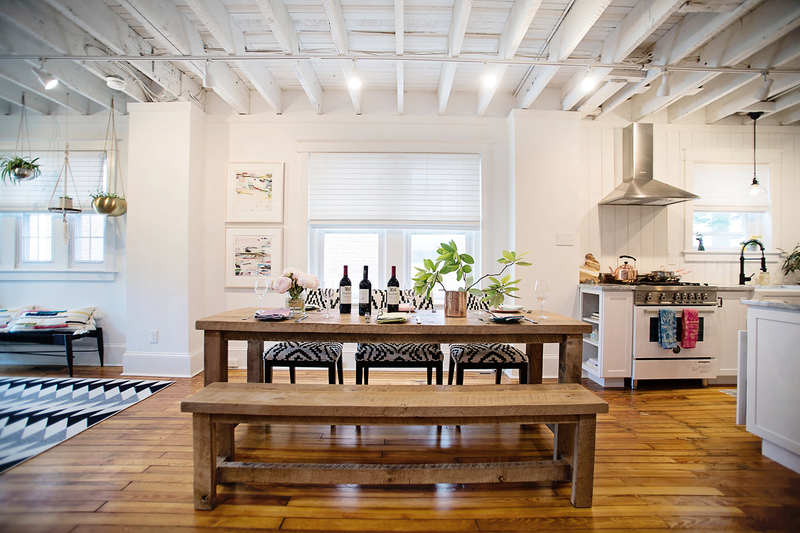 Q: How do people figure out their interior design style? A: Actually one of the best clues is fashion. One of the most helpful questions I ask new clients is where they like to shop for clothes. 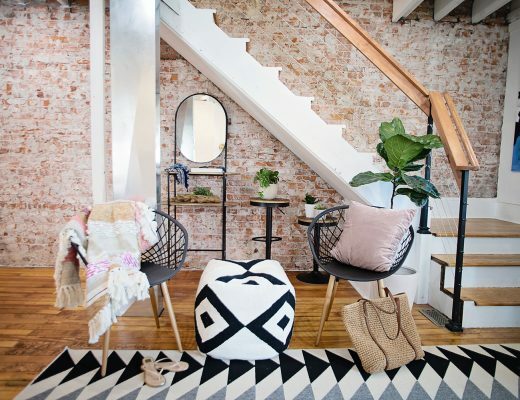 You might find that your interiors style, like your fashion style is more boho, preppy, casual, elegant, chic, neutral, colorful, or an eclectic mix. I created a 14 question Discover Your Design Style quiz that also helps, available on the bottom of my website. 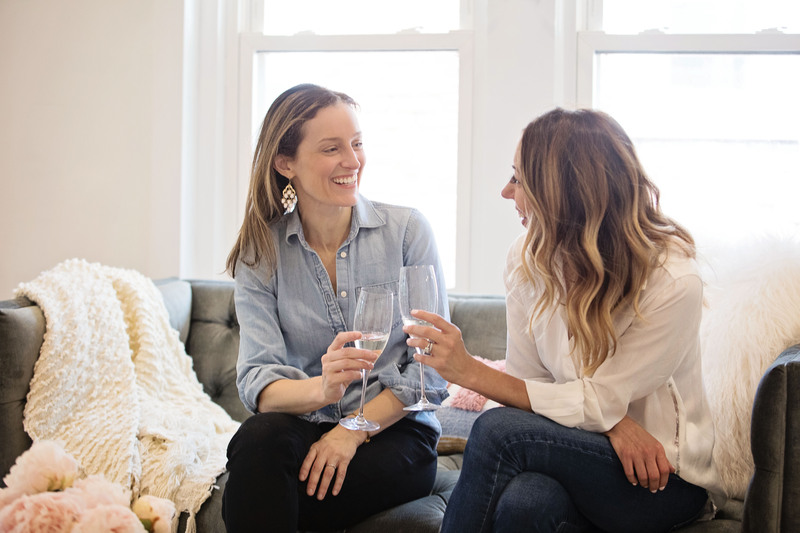 Q: What is your personal interior design style and what are you eyeing up from the Nordstrom Anniversary Sale? Q: Each of the spaces is a little bit different. How did you make that work? 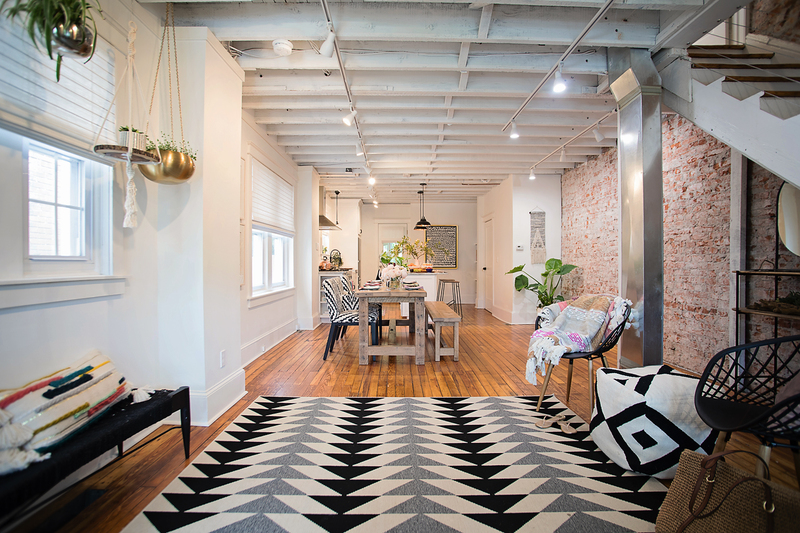 A: Lindsey and I thought that the first floor could have an edgy vibe with black and white geometric patterns and all of the industrial elements. We thought that their main work space on the second floor could have a softer more feminine feel. We made the spaces flow by repeating colors and style and using lots of plants! Q: Do you have a favorite design feature in this project? A: That is a hard one! 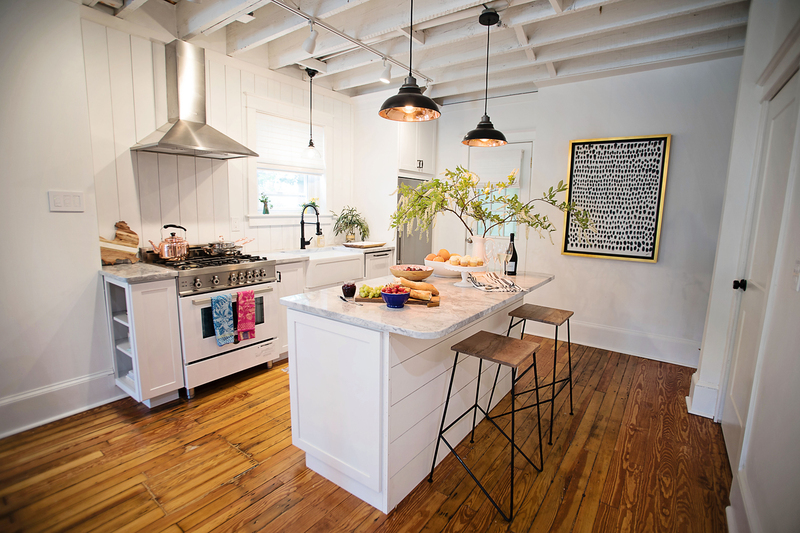 One that is not obvious but that I love is how we ran the shiplap vertical as the kitchen backsplash to go with the farmhouse industrial look, but with a twist. The vertical boards accentuate the tall ceilings and are a nice compliment to the ceiling beams. And then it’s horizontal on the island. 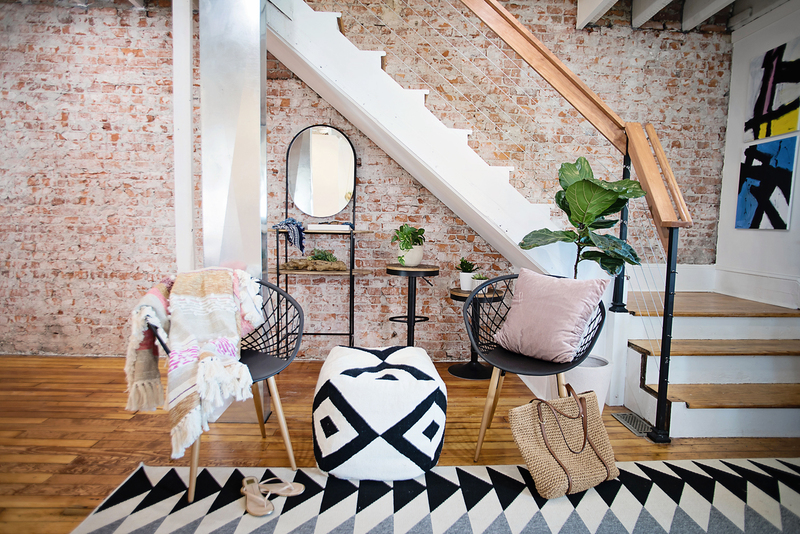 Lindsey had great ideas for using the space under the stairs and I just love the little seating are in the entry. I also enjoy the gray geometric style in the bar area and how it relates to tile in the close-by bathroom. Lighting is probably my favorite element in interior design and I love all of the lights! Q: What was the hardest thing about working on this project? A: Construction delays often happen and I have the hardest time waiting when they do. Otherwise everything about this project was a joy– Working with the Motherchic team was a dream, they are all so kind, appreciative, creative, and wonderful to be around. Q: What was the best thing about working on this project? Lindsey and Abby are incredible. The Golden Hands did a beautiful job with the renovation (finding the brick under the wall was definitely one of the best days!). Chadwick Hunter from Hunter Kitchen & Baths did a great job with the kitchens and wasn’t thrown one bit when we threw him a curve ball. Chad Barranco from Salvage Works fabricated the perfect farm table and bench from reclaimed lumbar, Lauren Anrig Addis of LAA Art Collective brought mind-bogglingly beautiful artwork, and Claudia Clobes of Urban Window Treatments added the most beautiful woven wood shades to complete the look. Q: Any quick design tips for readers? A: Don’t worry about rules or matching and just go with your instincts and have fun. 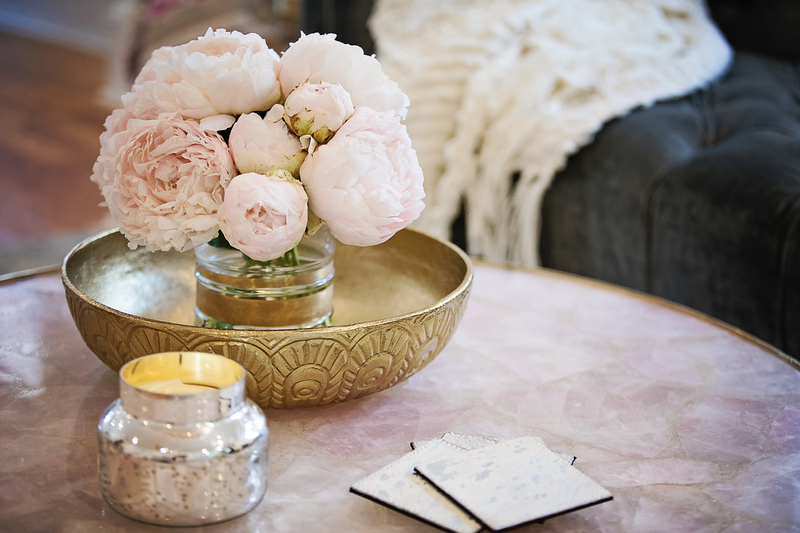 Interior design is best when it’s personal and meaningful so be sure to incorporate your keepsakes. You might even use them as inspiration for the full room, for example, your grandmother’s tablecloth might provide color palette and pattern ideas. Sometimes it’s great to give yourself a clean slate. Sometimes we get stuck in a rut and staring fresh can jumpstart inspiration. Take all your accessories out of a room and put some back gradually. 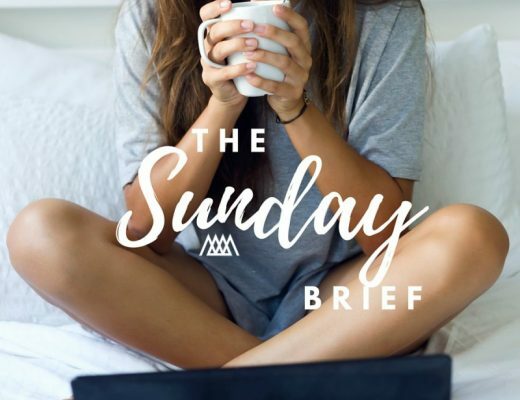 Don’t get too caught up in the details and instead focus on how a space makes you feel and if that’s the right vibe for that particular space. For instance does it feel bright, cozy, peaceful, invigorating, cheerful, relaxing…If the space feels right then it’s perfect! A huge thanks to Larina for sharing her insight! It was an amazing experience to have the opportunity to work with her. 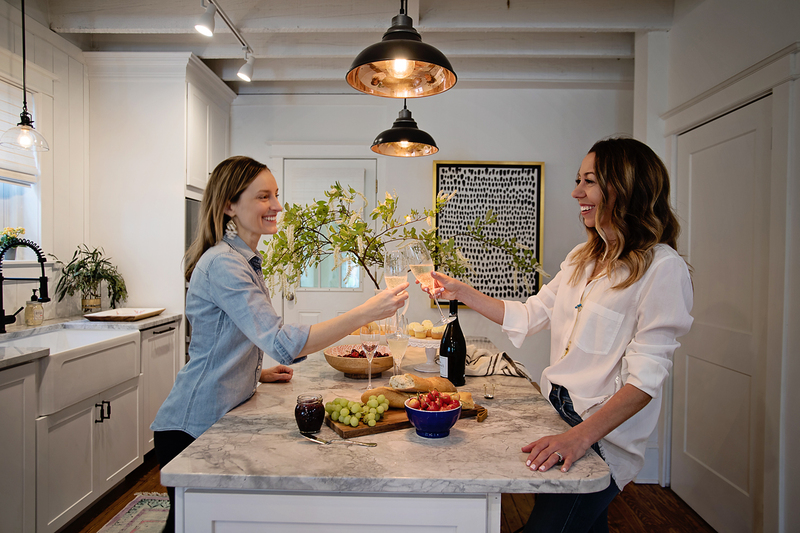 Not only did she articulate my design thoughts in to a beautiful space, but she introduced me to some of the best people in the business who helped with all of the finishing touches. Make sure to check out her website, profile on Houzz and most definitely follow her on Instagram!